Prince William and Kate Middleton have chosen two choirs, one orchestra and two fanfare teams to perform at their Wedding Service. 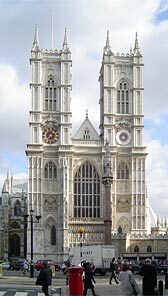 The Choir of Westminster Abbey is made up of 20 boys from the Abbey’s residential Choir School and 12 adult singers. They perform at the Abbey throughout the year. The Chapel Royal Choir also combines ten chrildren and six adult singers. The history of this Choir goes back to the Norman Conquest, they have performed at numerous Royal events. The London Chamber Orchestra will comprise 39 musicians and will be conducted by Mr Christopher Warren-Green. Also the Military will be represented: the Fanfare Team from the Central Band of the Royal Air Force and the State Trumpeters of The Household Cavalry each consist of active members of the forces. Some details of the Ceremony are already public: The service will begin at 11:00 amd will be conducted by the Dean of Westminster, the wedding ceremony will be performed by Rowan Douglas, the Archbishop of Canterbury, and the address will be given by the Bishop of London. Following the ceremony, William and Kate will return to Buckingham Palace in a carriage procession. There, they will be met by the Queen, who will give a reception for all who were invited to the ceremony. In the evening, Prince Charles will host a private dinner for the bride and groom’s closest friends and family. The staff of Westminster Abbey is currently busy with making sure that everything is ready for its 16th royal wedding. This includes laundering and ironing the High Altar cloth, which is more than 50 feet across. The BBC plans to use more than 30 cameras inside Westminster Abbey to broadcast the ceremony worldwide. This was written by admin. Posted on Wednesday, March 16, 2011, at 5:27 am. Filed under Wedding. Tagged BBC, Music, Westminster Abbey. Bookmark the permalink. Follow comments here with the RSS feed. Both comments and trackbacks are currently closed. i’m so excited and looking forward not to miss the event.i’ve already calendared the date and time so i wont miss it.. i’m happy for them and pray that their marriage will continue to shine and that their love for one another will last forever.As couple, may they become a good example to the modern world, full of values, a loving and caring family who also care for the needs of their brother and sisters. What honor, dignity, and fun! ‹ Who will receive one of the 5000 invites to the wedding?